Lynx Systems is supporting SCAW with their holiday fundraiser this year and also posted a note about us on their website. For 11 years Lynx Systems Inc. has been committed to the philosphy of working together as a team to make a difference. This year, the Lynx team is excited to support the excellent work of Sleeping Children Around the World. Sleeping Children around the world (SCAW) donations provide bedkits to children of any race and/or religion who will benefit the most; typically being located in underdeveloped and developing countries. No portion of a bedkit donation is spent on administration - 100% reaches a needy child. Each 35$ donation (Canadian Funds) provides a bedkit that consists of a mat or mattress, pillow, sheet, blanket, mosquito net ( if applicable), clothes outfit, towel and school supplies. Since founding by Murray and Margaret Dryden in 1970, SCAW has raised over $20 million to provide bedkits in 33 countries. In 2009 they reached their one millionth child. 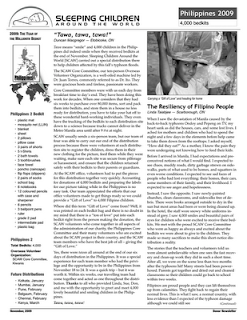 The donor newsletter for the Philippines special emergency bedkit distribution has gone to print and can be downloaded from the Sleeping Children Website. Photos are available in the Philippines 2 Photo Album. You can view them by clicking the link at left. Our inaugural Pinehurst Club breakfast met and exceeded our goals. With the support of our breakfast sponsor, TD Commercial Banking, our other sponsors (AVW-TELAV, EvansMartin LLP, The Bealight Foundation, Friends of SCAW and Flash Reproductions), and our donors of raffle prizes, we cleared $91,363 for Sleeping Children’s Legacy Fund so that it can continue to support the operating expenses of SCAW. Next year we celebrate SCAW’s 40th birthday with our second annual Pinehurst Club Breakfast at the Fairmont Royal York Hotel at 7:30 am on May 5th, 2010. Christine Magee, President and co-founder of Sleep Country Canada, the largest retailer of mattresses in Canada is the keynote speaker. Christine is a well-known and successful Canadian businesswoman who leads a company with a social conscience. She believes strongly in sharing knowledge and staying involved in the community. Watch the Sleeping Children Around the World website for more information. Again, this year we are pleased to be supporting the ‘Sleeping Children Around the World’ foundation, which provides ‘Bed Kits’ to children all over the world. For more information on this organization please visit their web site at www.scaw.org. Last year we raised $350.00 which was enough to purchase 10 bed kits. Click here to see the picture from the distribution of these bed kits earlier this year in the Phillipinnes. The picture shows the 10 children and the contents of a bed kit. Along with putting together a couple of fundraiser specials (go to our 'catalogue' for details), we are also expanding our fundraising efforts and increasing your shopping pleasure with the help of Fooditudes.com. We are going to donate 10% of all product orders (before shipping) from both Kettleby Herb Farms and Fooditudes.com (see the current newsletter for more info about this joint venture) until December 31, 2009. To sweeten the deal and encourage you to try our new ‘Garlic Unleashed’ -a cider vinegar & sunflower oil vinaigrette with an awesome garlic punch!, Kettleby will also donate $1.00 for every bottle purchased. And finally to seal the deal….. no handling fee on all product orders until December 31, 2009. *Orders from both sites can be combined too! An acknowledgement of your donation will be included with all product orders. Let’s see if we can top last year's total! Sleeping Children Around the World is being honoured by the Mississauga St. Michael’s Majors hockey organization. They have graciously dedicated the game scheduled for Sunday December, 13th to Sleeping Children. Dave Dryden will participate in the ceremonial puck drop that will precede the game. Many of us do not remember that Dave was the goaltender for the Majors in 1961 when they last won the Memorial Cup! All proceeds from the Teddy Bear Toss will be donated to Sleeping Children. Up to 1000 Teddy Bears will be thrown onto the ice by the fans following the Major’s first goal. These Teddy Bears will be collected and donated to the Boys and Girls Club of Peel Region and used to brighten a young child’s Christmas in our local community. Canadian Tire has generously donated all the Teddy Bears. The Mississauga St. Michael’s Majors hockey club will offer all “friends of Sleeping Children” an opportunity to purchase tickets at a reduced rate for the game. The game will be played at the Hershey Centre on Sunday December 13th against the Ottawa 67’s beginning at 2:00 pm. Gates open at 1:00 pm so be sure to get there early as a limited number of Bears are available for purchase. To order tickets please call 905-502-7788 x252 and order your tickets over the phone or through email at vyeghoyan@majors.ca. Just ask for the Sleeping Children Around the World ticket offer and you will receive a $10.95 ticket ($4.00 off the regular price). All tickets ordered through this special offer will be left at the Hershey Centre Box Office’s Will Call window. The game will also be broadcast on Rogers TV (Peel Region), Channel 10. Murray Dryden was on a trip to Lahore, Pakistan, in 1970 when he tripped over a child sleeping on the street. Instead of just walking away, Mr. Dryden felt compelled to do something. "It upset him," said Mr. Dryden's son, Dave. "And, it reminded him of his days during the Depression. ... It just hit him and it was like, 'No, this isn't right.' 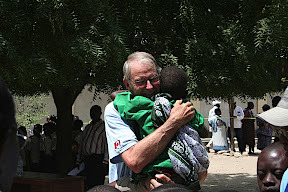 "
Mr. Dryden returned home to Toronto and told his wife, Margaret, that they had to start sending beds to street children in places like Pakistan and India. She agreed and together they bought a stack of bedding, clothing and mosquito nets and arranged to distribute the items to 50 children in India. Their friends soon found out about the couple's effort and began donating money to buy more beds. That prompted the couple to create Sleeping Children Around The World, using their home as an office. Over the years, SCAW has raised more than $20-million and now has 90 volunteers who work with agencies in countries across Asia, Africa and South America. This year the organization delivered its one millionth bed kit, made up of a mattress, mosquito net, clothing, school uniform and school supplies. Ms. Dryden died in 1985 and Mr. Dryden in 2004. They donated their home to the organization and a $3-million fund to cover all future administrative costs. The donation has meant that every dollar donated to the charity goes directly to buying bed kit supplies. The couple's children - Judy and former NHL players Dave and Ken - have carried on the legacy. Dave is chairman of SCAW and is heading to India in February with Judy to deliver 4,000 kits (Ken, a Toronto area member of Parliament, wanted to go but couldn't because of his parliamentary duties). All of the kit supplies are bought locally and Dave said the organization hopes to deliver 75,000 kits next year. "It's awesome," he said when asked what it was like to deliver a kit to a child. "You are out in the rural countryside and these people don't have anything. To get a bed kit like that, it has a huge impact on their lives. "What we are finding is that by giving a kid a good night's sleep and then the clothing to go to school, and the school supplies, we really are having an impact on their education." To celebrate the season, Windermere United Church is hosting a dramatic reading of Charles Dickens' A Christmas Carol in support of SCAW. "SCAW volunteer, our own inimitable Karen Shouldice, will be reading Stave 1. I've seen Karen on stage and you are in for a treat! Come out and cheer for Karen and SCAW. Please wear your name badge in case anyone has questions about SCAW. $15.00 donation at the door with all proceeds to Sleeping Children Around the World.